Serving as Executive Editor of the series Music of the United States of America from 1997 to 2003, I was charged with the task of exploring the feasibility of a critical edition of George Gershwin's Rhapsody in Blue. Among the signature works that define the soundscape of American music, the Rhapsody was deserving of more scholarly attention. Nevertheless, and despite repeated efforts, a decade later the edition remained just a dream. You can imagine my astonishment then, when I received word from our dean's office that a Todd Gershwin had phoned the University of Michigan's School of Music, Theatre & Dance to inquire if we might be interested in facilitating a critical edition of Gershwin works. It turned out that Todd was a 1997 graduate of the University of Michigan and that his family had become interested in making certain that George and Ira's legacy of musical imprints received a depth of schol- arly attention that matched its impact on American culture. They had been hearing repeated complaints from musicians that the performance parts in circulation, even for a masterwork such asPorgy and Bess, were in dire need of editorial attention. For example, the only edition of George Gershwin's Cuban Overture published during his lifetime is a version for piano four hands. It differs from the later published orchestral score and parts in one especially important detail—the ending. The piano version has two extra bars, such that the penultimate measure is heard three times before a climactic sonic shout brings the piece to a close. The orchestral score and parts—those currently available to ensembles for performance—lack the repeating bars. Why the discrepancy? A review of George Gershwin's personal copy of the manuscript score, one from which he himself conducted the work, matches the commercially available imprint. Closer inspection, however, reveals that written in pencil above the second to last bar in George's hand is the notation "3 Times." It seems clear then that at some point between the overture's 1932 premiere and the 1933 publication of the piano score, Gershwin revised the ending, extending the cadential gesture to add drama, intensity, and impact to the percussive close. He wrote this change by hand into his personal copy of the score and transferred it to the publication of the piano version. Presumably the composer would have done the same when he oversaw the publication of the full score—but tragically he never had the chance. George died precipitously of an untreatable brain tumor on 11 July 1937. He was only thirty-eight years old. 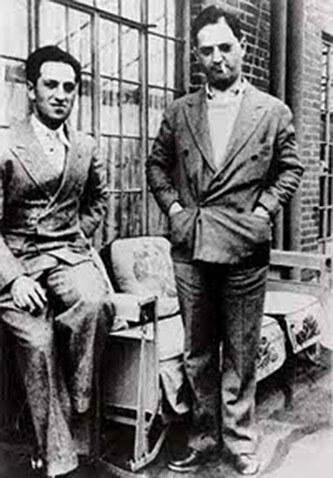 George and Ira Gershwin, New York, 1928. Courtesy of the Ira and Leonore Gershwin Trusts. George Gershwin's early death is one reason that current publications of his music are checkered with mistakes and omissions. Performance parts for his iconic Rhapsody in Blue offer a characteristic example in which multiple sets of parts, each with different editorial cuts, create a situation in which no authoritative version exists. Emblematic works of the American soundscape—the Second Rhapsody, the Variations on "I Got Rhythm," An American in Paris—articulate sonic crossroads of styles and cultures forged in Gershwin's musical imagination but are distorted by errors. Lines of dialogue written by Ira for the folk opera Porgy and Bess are missing from the its performance materials and full score, much of which is in such poor physical condition as to be all but a cipher for the conductor. The George and Ira Gershwin Critical Edition promises to resolve these editorial discrepancies and provide freshly engraved performance materials for all of the brothers' works. The edition will save rehearsal time and frustration, improve the quality of performances, and lead to a deeper understanding of these works by scholars, musicians, students, and audiences alike. The editorial challenge results from the Gershwins' pioneering aesthetic, a creative approach that transgressed boundaries of style, genre, and especially cultures. Ira's lyrics offered keen insight into the changes of modern life, while George's ear embraced sounds from the street and the club to the stage and the concert hall. Such aesthetic diversity presents unusual editorial demands, including the recognition of African American idioms and Broadway scoring shorthand. A prevailing goal of the Edition will be to celebrate this broad aesthetic range, presenting not a single Rhapsody in Blue, for example, but multiple versions that capture the life of the Gershwins' music on different stages. For Rhapsody in Blue this will include at minimum the 1924 jazz version, the 1926 orchestral version, and George's own two-piano score for the work. The Edition will also include first-ever publications of the Gershwins' film music, including scores for Delicious (1931) and Shall We Dance (1936), in full score. Ira and George Gershwin, Beverly Hills, 1937. Courtesy of the Ira and Leonore Gershwin Trusts. 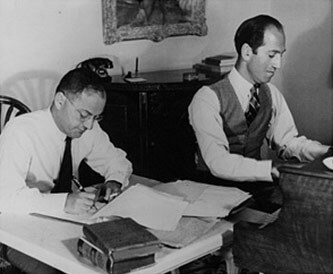 The families of George and Ira Gershwin, especially their nephews Marc George Gershwin and Michael Strunksy, inspired the project, working with the University of Michigan and drawing upon the expertise of its American Music Institute. The project likewise has deep connections to the Hitchock Institute. Once a Michigan faculty member, H. Wiley Hitchcock served as a founding board member of the AMS Committee on the Publication of American Music. This group continues to oversee Michigan's NEH-funded collaborative publishing project—Music of the United States of America (MUSA), a series of scholarly editions of American music, administered by the American Musicological Society and published by A-R Editions under the editorial aegis of Richard Crawford, a Hitchcock student. The new Edition is modeled on MUSA and will be published through European American Music in New York. 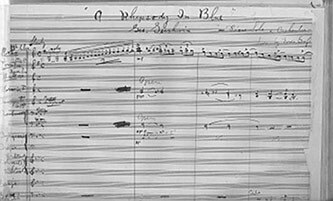 Draft of Rhapsody in Blue by George Gershwin. Courtesy of the Library of Congress. Expected to be a three- or four-decade effort, the George and Ira Gershwin Critical Edition will be part of a larger educational initiative to include courses, performances, and symposia on the University of Michigan campus. The new edition of Porgy and Bess, edited by former Library of Congress music division staff member Wayne D. Shirley, is already in draft. The editorial board includes Ryan Bañagale, James Kendrick, Michael Owen, Loras Schissel, Karen Schnackenberg, and Wayne Shirley. Project advisors include members of the Gershwin family, plus William Bolcom, Richard Crawford, Michael Feinstein, Walter Frisch, Thomas Hampson, Joseph Horowitz, Laura Jackson, Andrew Litton, Alan Menken, Joan Morris, Robert Nederlander, Sr., Jessye Norman, and Michael Tilson Thomas. Further details about the project can be found at http://www.music.umich.edu/ami/gershwin/.